This post was sponsored by AMC Theatres and Coca-Cola. The opinions are completely my own and based on my experiences. Back when I taught middle school, it seemed that parents were giving their kids much more independence right at a time when they were regressing a bit and needed their parents more. It’s something I’ve kept in mind while raising my kids. It’s one of the reasons we try to carve out one-on-one time with each of our children every month. I know it’s not easy. Parents have work and home responsibilities, and hopefully time for hobbies and decent sleep. Kids have sports and extracurricular activities, social time, chores and school work. Finding time to connect can be tough, but it’s worth it. 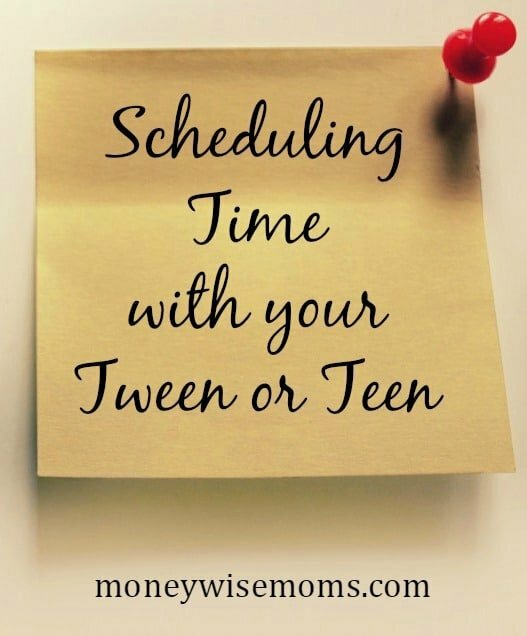 You may find that the only way to accomplish it is scheduling time with your tween or teen. Finding time to spend with each child can be tough, but with three kids and a busy life, we make it a priority each month to have a little one-on-one time with each kid. With the help of AMC and Coke, I’d like to send you and your tween or teen out for a night together. Through April 10th, AMC Theatres and Coca-Cola are running a special offer. When teens show their student ID, they can get the $5 popcorn and Coke Teen Deal. It’s a great value that makes that night out even more of a treat. Download the coupon to show on your phone, and head out to the movies! Five lucky MoneywiseMoms readers will win 2 AMC Movie Tickets to take your tween/teen out for some quality time. To enter to win, please use the Rafflecopter below (you may need to click over to the blog if you’re reading this on mobile or in a feed reader). This movie ticket giveaway ends at midnight on Sunday, April 3rd. I’ll email the winners, who will have 48 hours to respond and claim the prize. Good luck, and thank you for reading MoneywiseMoms! This prize was provided by AMC Theatres. 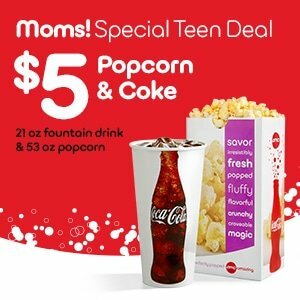 AMC Theatres and The Coca-Cola Company are not a sponsor or administrator or connected in any other way with this giveaway. I have two boys and would take them . I’ll be honest, I am not sure what movies are even out – it’s been so long since we have been to a movie. I am not a movie mom but wanted to add that yes spending time with your tweens and teens is important. Each kid has their own needs and its important to recognize this. My teen loves movies. I am not sure what is even out as we don’t go often. Would love to have a movie night with him. I’ll take my niece to see allegiant. I have been wanting to see Zootopia with my little guy! I will take my daughter. Not sure what we will see yet! We literally go to AMC every Friday night for Date night! I am looking forward to BFG coming out or Harry Potter’s Magical Creatures! This would be a special treat for my sweet 11 year old! I’d take my mother in law to see a movie–any sort of comedy. My tween wants to see the Jungle Book movie… definitely would take only him… no little brothers for this one. My kids want to see the Jungle Book! I’ll go see the new captain america movie with my daughter, she’d love to go see that! My tween really wants to see Zootopia! I would take my daughter to see Zootopia! I’d see My Big Fat Greek Wedding 2 with my daughter. I would go with my daughter to see My Big Fat GreekWedding 2! Thanks for the opportunity. ESPECIALLY as my daughter nears graduation, nothing is more valuable to me than time spent with her! We bond over shopping. I’d take my son and see the 5th Wave. I’ve tried to tell him he’d enjoy the books so perhaps if he saw the movie he’d give them a try. i would let my mom pick! My boyfriend and we would go see Batman vs. Superman! My children are 15 & 17- any reason for them to hang out with mom makes me happy!! I would so take my daughter to the movies. And I’d limit myself to a small popcorn. I have a three month old baby and a toddler. If I win hubby and I will go on a date night! Great idea. Kids of all ages love movies.